It can be difficult to know when and where it is appropriate to leave a tip. 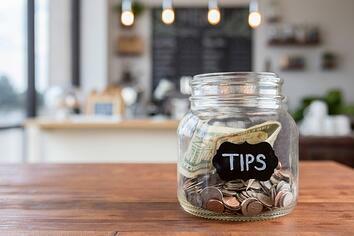 To help you out, we’ve created this helpful guideline of when you should or shouldn't tip. For many waiters, they are making less than minimum wage making them dependent upon tips. So unless the service was just absolutely atrocious, i.e. the waiter was rude AND they messed up your order AND they spilled on you, etc., you should leave at least somewhat of a tip. When in doubt, leave a small tip and then share your concerns with a manager. Some restaurants may split up tips among the entire wait staff and not tipping could affect someone else. If you dine with a large party, a tip or gratituity may be included with your final bill. When you order at the counter, seat yourself, pick up your own food, and clear your own table, a tip may not be necessary. However, if you had a large/complicated order or received service that went above and beyond expectations, feel free to leave a tip. You may also want to consider leaving a positive review on their website or Facebook page. People are less likely share good experiences than they are with a bad experience. For certain professions, you may be looking for a way to express your gratitude. For example, tipping a bellhop $1 - $2 per bag for bringing your luggage to your room is acceptable but tipping your child’s teacher is not. Instead, express your gratitude with a small gift or token of appreciation. If you use a skycap at the airport for your luggage and check-in, you should tip about $1 - $2 per bag. When traveling to another country, do your research to find out how tips work. In some countries, the tip is included in your bill, making it unnecessary to leave more. In other places, tipping is not part of the culture. If you are going a cruise, gratuities are usually included at the end of your voyage into your final bill. This amount can differ depending on the cruise line and how many people are in your party.